The New York Times Feminist Reading Group was a participatory performance where the public was invited to engage with that day’s issue of The New York Times from a feminist perspective. The reading group met regularly between December 2013 and December 2014. During these regular meetings the reading group collaboratively collected and annotated news items, images, advertisements, editorial comments, typos, formatting notables, etc. These notables were flagged, scanned, and archived for the publication. Check out this New York Observer article about the Reading Group. The culminating publication, The New York Times Feminist Yearbook, is a diverse portrait of the year, not only its events, but also the media landscape in which it appeared, and the varied feminist perspectives of the project’s participants. 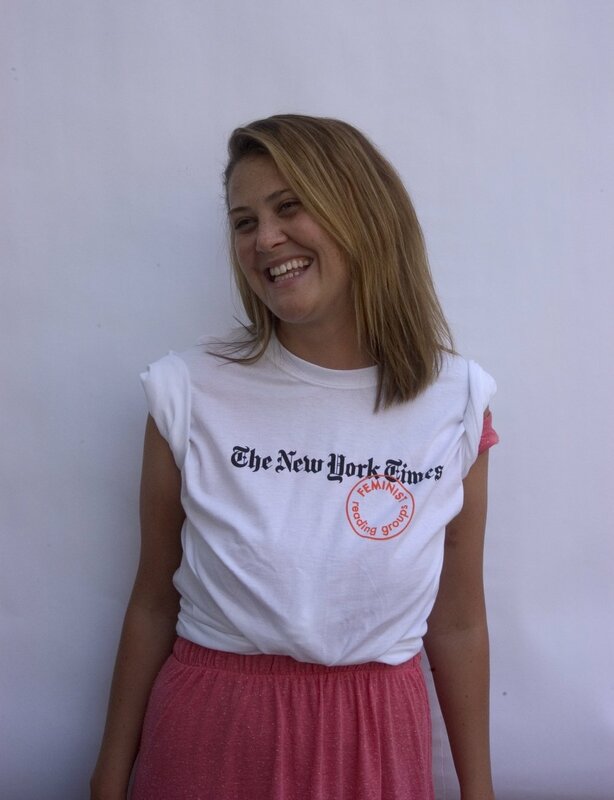 Jen Kennedy and Liz Linden created a photographic series, documenting the free t-shirt giveaway supporting their New York Times Feminist Reading Group. The t-shirt "giveaway," entitled Bedford Ave, Brooklyn (The New York Times Feminist Reading Group), was transactional; anyone could take a free t-shirt as long as they pose for a photo wearing it. These photographs were stand-alone portraits of New Yorkers, in all their political complexity and diversity. It was visually compelling as a portrait of the city and also served to encourage discussion not only of contemporary politics but also our local newspaper, and the media landscape at large. Liz Linden is a Brooklyn-based artist. Her work has been exhibited in various public and private institutions in New York including Ludlow 38, Bureau, and Art in General, as well as internationally at the Lunds Konsthall (Sweden) and the FRAC Ile-de-France/Le Plateau (France). Her work points to contradictory messages transmitted by the form and the content of the objects that make up the contemporary American environment, often referring to literary theory, semiotics, and feminism. Jen Kennedy is a Canadian artist and writer. Her work has been exhibited and performed throughout New York and her writing can be found in Grey Room, Image & Narrative, and C Magazine, among other international journals and magazines. She is currently completing her dissertation on gender in the work of the Situationist International.